How much time you need to finish? How to use the NaNoWriMo calculator? NaNoWriMo is over. What now? Ever dreamed of writing a novel? Or seeing your name in print? This fall, your dreams will come true! Join thousands of writers from all over the globe during the National Novel Writing Month (NaNoWriMo) and spend your November in a slightly frantic, coffee-induced haze of insanity writing your 50,000-words-long novel in just 30 days. If you've never participated in NaNoWriMo before, you might be wondering if you read that right. We bet you did, but go ahead and read it again. Fifty thousand words. Thirty days. One novel. You don't like stats? Come on. All Wrimos like stats, especially if they're ahead of their writing schedule! National Novel Writing Month, or NaNoWriMo for short, is a writing challenge. Every November, thousands of writers from all around the world commit to writing 50,000 words of their own prose in a month. In 2017, NaNoWriMo had over 400 thousand participants. All these people (whom we sometimes call Wrimos) form an incredible, one-of-a-kind support system that makes it impossible not to enjoy the challenge. After all, we're all in this together! It shouldn't come as a surprise that, if you're struggling to write so much in just a month, you need a way to find out how well you're doing. While the NaNoWriMo website provides a wonderful graph where you can track your progress and see the numbers growing every day, we created our tool as a fun expansion that lets you see even more stats! The unique feature of our calculator is the estimation of the time you spend writing. It's nice to say that you wrote a novel in a month, but hey, saying you wrote it in 60 hours gives you even more bragging rights! 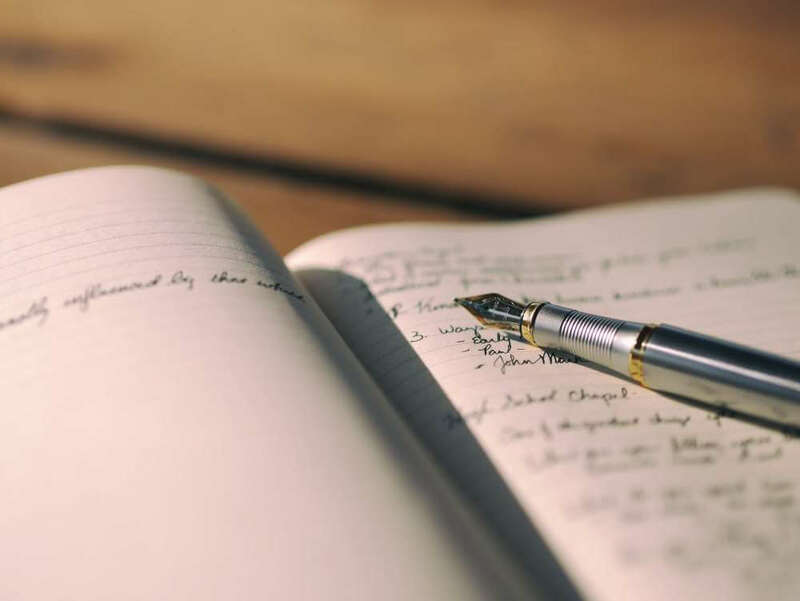 Moreover, we decided that you might want to undertake your own writing challenge, with a different word goal or in an entirely different timeframe. This NaNoWriMo calculator lets you customize every aspect of goal-setting and adjust it to your needs. 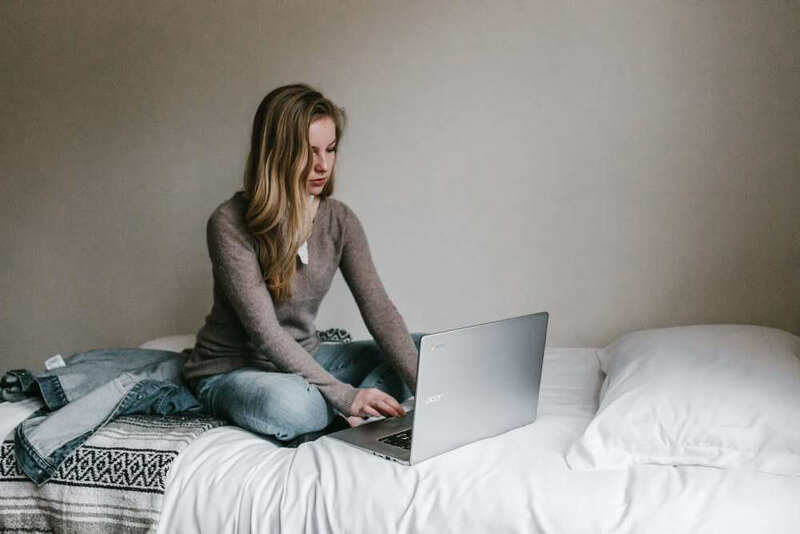 Our NaNoWriMo calculator is divided into four sections, each of them designed to give you valuable insight into a different aspect of this writing challenge. Goal setting. In this section, you can define how many words you want to write, and choose a deadline for yourself. Naturally, we set the default values of 50 thousand words and 30 days, but you can adjust that as you think fit. Your progress until now. Use this section for a quick mid-November reality check: how far along am I? All you need to do is enter two numbers: today's date and the total number of words written until now. 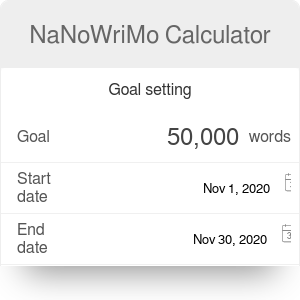 Our NaNoWriMo calculator will tell you when's your predicted finish date, as well as what percentage of your novel is ready. Are you on track? This section allows you to plan in advance for the rest of the month - it tells you how many words (and days) you still have left, and how much you need to write every day in order to finish your novel on time. How much time you need to finish? This section recalculates the words you've been writing into hours of furious typing. All you need to do is provide your writing speed in words per minute. The default value, 15 wpm, is an equivalent of 1000 words per hour; if you decide to write by hand, or if you've recently won the typing speed Olympics, this value will probably be different, though. Did our calculator gleefully inform you that the predicted finish date is May 14, 2039? Or maybe you're just experiencing the Week 3 Syndrome? Relax - we have a few foolproof tips that can help! Word wars. Seriously, there's nothing better than a word war with fellow Wrimos to boost that word count of yours! How does it work? You set a timer to a very short period, for example 20 minutes, and race your friends. The person with the highest word count is the winner! Cookies. And chocolate. And coffee. Use the Thanksgiving break to catch up. If everything else fails, lock yourself in a room over Thanksgiving, refuse that third serving of mom's turkey, and write, write, write! First of all, congratulations! Regardless of whether you wrote 2,000, 15,000, or 50,000 words, you deserve the highest praise, a lot of sleep, and a huge "Thank God It's Over" party. Once you've rested a bit and can think clearly again, make sure to relax before you come back to your novel. Grab a book, go for a walk with your dog, call your friends you haven't seen for a month. After some time has passed, read your novel. For sure, you'll discover it's a terrible mess, a bundle of words that barely make any sense. Over the next months, you will be revising it, polishing it, scrapping pieces of it and melding them together again. At some point, they will form what you dreamed of in the first place: your novel. And then? Then write another one. NaNoWriMo Calculator can be embedded on your website to enrich the content you wrote and make it easier for your visitors to understand your message.